Although a relative newcomer to the home security industry, Frontpoint is one of the top contenders in the world when it comes to providing trustworthy home security systems. With Frontpoint as your provider, you can rest assured that your home is being shielded by one of the most reliable and most comprehensive home security systems around. Frontpoint is a tech-friendly company which offers cutting-edge technology and a DIY system that will match anything currently available in the home security industry. They also provide excellent customer service with fantastic reviews across the board. This company is perfect for first-time home security system owners, renters, or those who want to take their equipment with them when they relocate. 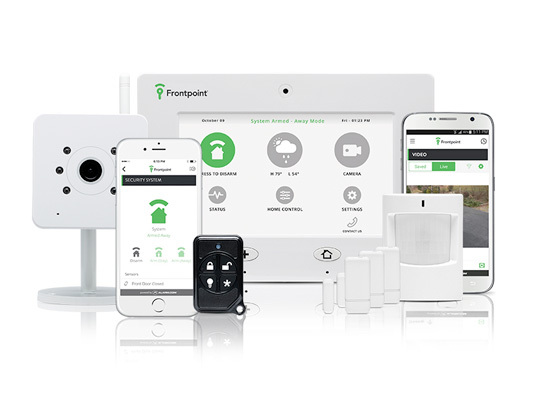 Frontpoint home security offers 24/7 professional monitoring, a 100% wireless home security system, full home automation integration, customizable packages, outstanding customer service, and 30-day risk-free free trial! After assessing and discussing all your unique home security needs, a Frontpoint representative can, based on the information you've provided, be able to put together a home security package that will suit your home and your lifestyle best. Once your pre-programmed Frointpoint home security equipment arrives, it can be installed in no time at all. The process is quick and simple, and there are no installation fees. The equipment can easily be activated in less than 30 minutes with full online support provided. Best of all - if you're not happy with any part of the system or the service that you have been provided, you can return the equipment within 30 days for a full refund. Frontpoint offers professional monitoring on a completely wireless home security system, backed up by a dedicated cellular monitoring service. With Frontpoint, you know you will remain protected at all times and there will be absolutely no interruptions to your service. Frontpoint's home security contracts are fairly straightforward and include 3 different packages. Essentially, there are three different monitoring levels you can opt for, and you can choose between a one or three-year contract. At the end of your contract, you can choose to extend it for another one or three-year term. Additionally, you can also upgrade or downgrade the monitoring level whenever you want. Frontpoint's home security systems are 100% wireless and come standard with fire, flood, and carbon dioxide protection. 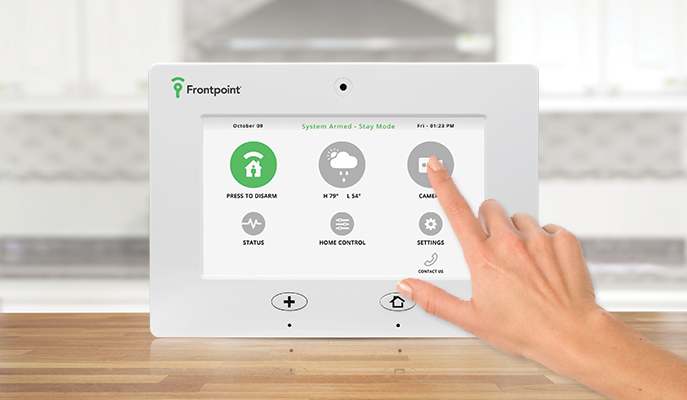 Frontpoint's GE control panel is the gateway to your home's security system. It runs on a secure cellular network with 24-hour backup battery, so it won't matter if there is a power outage or any interruptions to your internet connection. Once the panel is activated, you can arm or disarm your alarm, schedule home automation features, and do so much more from anywhere in your home. The control panel also has an internal alarm that's very loud - 100 decibels to be exact! When the alarm sounds, it continues for four minutes unless it is manually turned off. This is loud enough to alert anyone inside of the home, and give the intruder a frightening and disorientating surprise. Frontpoint has a range of choices to control what happens in and around your home. Thanks to free apps for iPhone, iPad, Windows, and Android devices, you can now control your thermostat, lights, locks and more from just about anywhere. The system is even compatible with voice commands. Frontpoint's home security cameras are some of the most advanced in the industry. You can add up to four, which are then monitored via your smartphone app. This is private, and you are the only one who can see it. However, you are able to share the feed with up to 10 people. 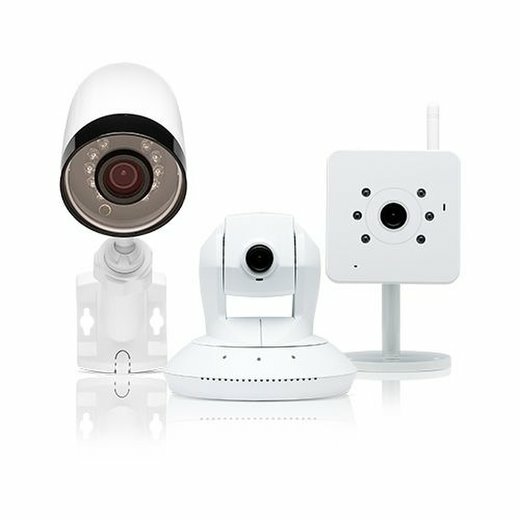 There are both indoor and outdoor cameras available which work with your home’s internet connection and powered by your home’s electrical system. Cameras can be set in place to have fixed views, or you can choose a pan/tilt camera in order to have a wider view as the camera moves from side to side. You can store video from the camera on Frontpoint’s servers, which affords you about 90 minutes of footage. If you want to keep more, Frontpoint can assist with this as well. Frontpoint's motion sensors are passive infrared sensors (PIR), meaning that they can detect movement by monitoring changes in infrared radiation. You can have as many as 39 sensors connected to each system. Each sensor has a 90-degree field of vision and a range of about 35 feet. With these in place, you can literally cover a room as large as 1,000 square foot. The sensors are pet-friendly too, so animals smaller than 40 pounds will not trigger the alarm. Frontpoint is among the best security companies around for both homes and small businesses that want a choice between basic or advanced wireless equipment alongside a professional monitoring service. 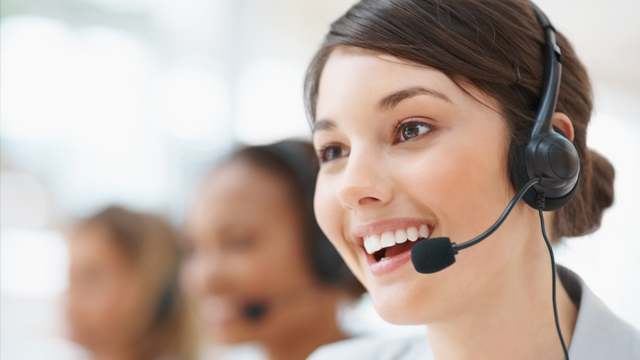 Frontpoint offers their customers a high-quality security system backed up by excellent customer service. The system is easy to set up on your own, and it is perfect if you want equipment you can take along with you when you move. A 100% wireless system with no landline required. This means no interruptions in the service and home security monitoring. Excellent customer service and transparent pricing - perfect if you are interested in trying out a new system for a trial period. Easy to install, easy to use, and there are several customizable options to help you get the best out of your home security.